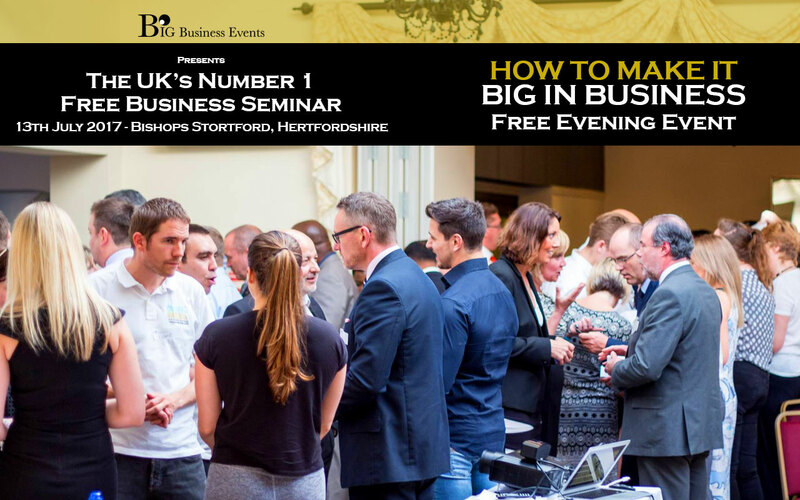 The UK’s leading free business event ‘How To Make It Big In Business’ will be the Great Hallingbury Manor Hotel in Bishops Stortford for an evening of inspiring business speaking and high-quality networking. You want a strategy that will make you money within as little as 30 days. You want to stay ahead of the competition with cutting edge strategies from the UK’s leading business experts. You achieved some success in business but want to get to the next level. You want to create a business that dominates your market. You’re struggling to take action and responsibility for what needs to be done in your business. You have few people outside of your business and personal life that you can talk to about your work stresses. You want to create wealth or success in abundance. You want to gain new, like-minded connections with business owners just like you. You want to get educated with the latest business strategies from leading experts. Sound too good to be true? Find out when we meet you at the UK’s No.1 free business seminar. Adam will be joined by Raw Talent Academy Managing Director, BBC ‘The Apprentice’ winner and Co-Founder of Big Business Events, Lee McQueen.